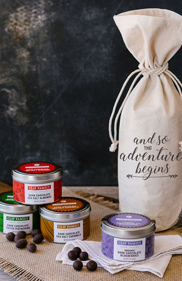 Savor California-The online showcase for gourmet specialty foods and beverages from California. Located just south of downtown St. Helena, the Clif Family tasting room is a unique place where the passions of cycling, wine and food are celebrated and blended. Taste Clif Family Wines, enjoy a snack or an espresso drink, and embark on a world-class cycling excursion, all in the heart of Napa Valley. A Northern Italian-inspired menu of farm fresh bruschetta, salads, rotisserie chicken and sweet treats. The menu changes daily. The Bruschetteria Food Truck can be found at the Clif Family tasting room in St. Helena every Tuesday through Sunday from 11:30am-4pm. They are open late for dinner on Wednesdays. sign up	for our mailing list. If you’re a serious cyclist, like Gary Erickson and Kit Crawford, you need fuel. In 1990, on a 175 mile bike ride with his cycling partner and best friend, Gary realized he could not take another bite of the “other” bar on the market at the time. He had an epiphany that he could create a new, better tasting bar. After months of experimenting in the kitchen with his mother, Gary came up with the “right” recipe and Clif Bar was born. He named the bar after his father, Clifford, the man who introduced him to wilderness adventures and encouraged him to follow his passions in life. Clif Bar and Company continues to innovate and promote sustainable practices. Cycling trips in Europe invariably were capped off with a wonderful meal and a glass of wine, a practice that was continued when Gary and Kit moved their family to the Napa Valley. Grapes grown on the organically farmed ten acres of Clif Family Vineyards, as well as other premium fruit from Napa Valley and Mendocino growers, go to make Clif Family Wines. Clif Family Napa Valley was started in 2008 following the release of their first wines. Produce grown on the CCOF certified Clif Family Farm is used to create delicious extra virgin olive oil, fruit preserves, marmalade and chutney. 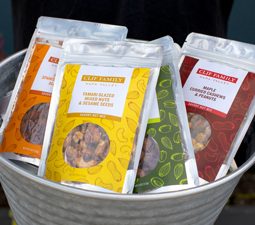 The Savory Nut Mixes and Dark Chocolates, were created to pair with wines in their St. Helena tasting room as a way to highlight how food and wine complement one another. Executive Chef John McConnell continues to develop new products. Whether Dukkah Spice Blends or Porcini Spice Rub, there is always something new to delight the palate. Some items are made in limited production to be sold only to Clif Family Club Members. Others may appear on the menu of their Bruschetteria Food Truck (see sidebars). The theme of all products created by the folks behind Clif Family Napa Valley is to create foods that pair with wines and offer a complete culinary experience. Pairing suggestions and recipes are created by Chef McConnell to showcase the connection of Clif Family Wines and these artisan food products.